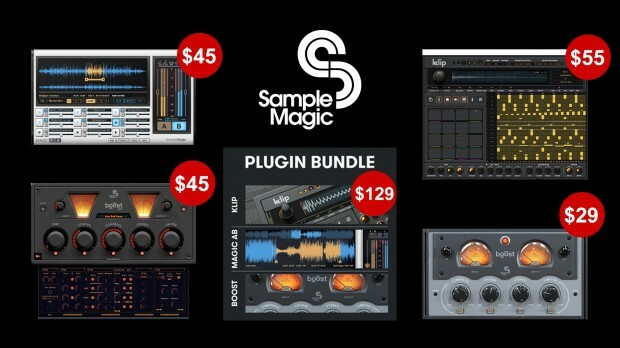 You can get 30% off on the Sample Magic plug-ins right now until the end of November. Grab them fast and save some money! Sample Magic is the world’s leading provider of pro-audio loops and samples to music producers across a range of genres, from house and electro through dubstep to disco to chillout and soundtrack. Developer of the Magic AB, a simple, powerful reference tool that allows you to switch between the audio you are working on and up to nine tracks in an instant. Klip is a powerful instrument and drum machine that pushes the threshold of electronic music production, utilising an expansive parameter editing matrix and comprehensive mixer functionality. Boost Pro is an all-in-one audio finalizing utility with six independent effects each utilizing advanced, automatable, parameter control. This entry was posted in DontCrack, Plug-ins, Promotions and tagged Boost, Boost Pro, KLIP, Magic AB, Plugin Bundle, Sample Magic, Sample Magic Cyber Week sale. Bookmark the permalink.